After 1 year of development and more than 700 commits authored by a hundred contributors across the world, the new major release of API Platform is immediately available for download. * @var int The id of this book. * @var string|null The ISBN number if this book (or null if doesn't have one). * @var string The title of this book. Checkout our demo to play with a more advanced example (source code, only 2 classes)! Hypermedia relations are handled out of the box. Leveraging any other feature of API Platform is just a matter of adding a few lines of configuration. Learn more in our getting started guide. If you don’t like annotations, you can use XML or YAML configuration files instead. If you don’t like the Doctrine ORM (or doesn’t want to tight the exposed data model to the internal model of the database); or if you don’t want to use the Symfony validator, you can create adapters to hook your custom code and use your preferred libraries. API Platform is designed to be fully extensible. The app is up and running, browse http://localhost to get started. API Platform’s images can be deployed easily in production using Docker Swarm (Amazon Web Services, Azure…) or Google Container Engine (with Kubernetes). Instead of crafting your own data model, why not reusing an open vocabulary like the very popular Schema.org and feel the power of Linked Data and Semantic Web? Yes, just like Google but for free. Since its first release, API Platform comes with a handy code generator allowing to bootstrap a whole PHP data model including classes, properties, getters and setters, full PHPDoc, Doctrine mappings, API Platform’s external vocabulary mappings and validation annotations. This generator has been updated to match the new configuration format of API Platform 2 and to allow generating custom classes and properties. Learn more about the generator in the docs and the demo application. This config enable all built-in formats (Symfony 3.2, actually in RC stage, is required for YAML and CSV support). Then, you can request the format you want through the UI using the proper Accept HTTP header, or by adding the format name as extension of any URL of the API (example: https://demo.api-platform.com/books.jsonld). Support for formats not supported by default can be added by writing custom adapters. Learn more about content negotiation in API Platform. 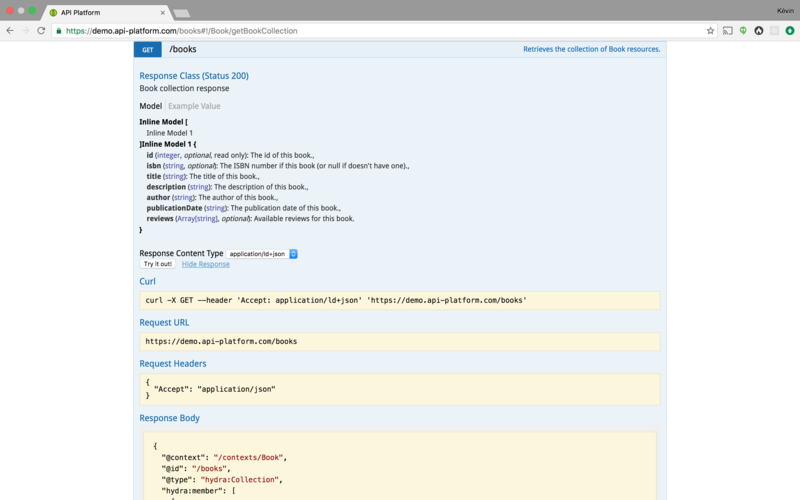 API Platform 2 generates an extensive Swagger 2/OpenAPI documentation. All URLs and types are automatically described thanks to our powerful metadata extraction system. A web interface built on top of Swagger UI is also automatically available. Request any API’s URL using a web browser and (thanks to the Accept header sent by the browser), API Platform will display the request sent to the API and the received response in a nice web interface. It will also display a human-readable documentation of the current operation. Browse the homepage to see the documentation of all available operations, including the description of resources and properties extracted from PHP metadata. Use the sandbox to play with your API. 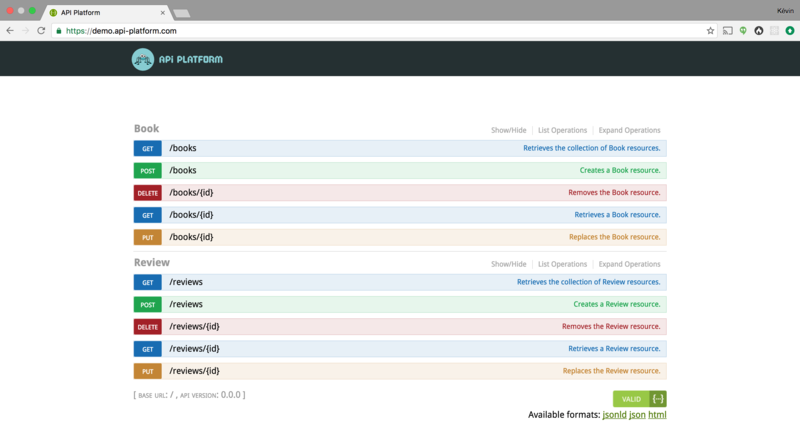 The filters are now available directly from the UI and documented in both Swagger and Hydra formats. Learn how to add filters to your API collections. Filters are now implemented using the brand new extension system. This system allows to hook to the database query generation process and to customize them. It’s particularly useful to implement security features. Learn how to leverage the extension mechanism to filter the result of an entrypoint depending of the role of the connected user in the documentation. API Platform 2 follows OWASP’s security recommendations for all its built-in features. We created a test suite to ensure that all recommendations applying to API Platform are followed and documented. Checkout what API Platform 2 do to secure your API. We are continuously improving the performance of API Platform and Symfony components it uses (like the Serializer or the PropertyAccess component). This new version is faster than v1 and automatically optimizes SQL queries regarding current serialization groups. API Platform 2 is also compatible with PHP PM. When using it, API response times are divided by 10. All those components can be used separately to create your own APIs. For now, the Core library must be downloaded, but a subtree split to allow specific component installation will be available for the 2.1 version. Specific classes can already be used separately of the standard distribution, and without Symfony. We also moved the code generic enough directly to Symfony. For instance the new Symfony’s PropertyInfo component has been extracted from API Platform. Some new bug fixes and new features and like the MaxDepth as well as YAML and CSV support for the Symfony Serializer has been done while working on API Platform. 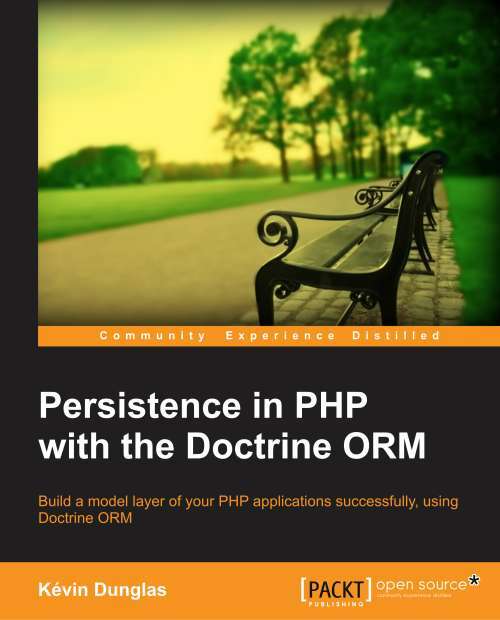 Doctrine has never been mandatory to use API Platform, but the set of interfaces to implement to use another persistence system has been rethought and is now documented. We dramatically improved the quality of the API Platform code base for this v2. API Platform v1 was already well tested through Behat. In v2 we added a lot of unit tests to prevent bugs and prove that every class respect SOLID principles. The code coverage is now of 96%. Our test suite is automatically run both on Linux (using Travis) and Windows (using AppVeyor). We also used Scrutinizr and SensioLabs Insight to detect bad practices and improve the overall quality of our code base. API Platform is rated 8.7/10 on Scrutinizr and has the Platinum medal (best rating) on Insight. The documentation has been improved, almost all new features documented and the Getting Started guide fully rewrote. A new website built with React and Redux has also been created. It supports universal rendering and provides a powerful search engine thanks to Algolia’s DocSearch. API Platform it’s more than 100 contributors, an awesome core team (Amrouche Hamza, Antoine Bluchet, Samuel ROZE, Teoh Han Hui, Théo FIDRY, Vincent CHALAMON and myself), workshops and conferences talks across the world (don’t miss the workshop at the Berlin’s Symfony Con next week). API Platform has been in the top GitHub trending PHP repositories several times during past months (and 1st one time) beside great projects like Laravel, Symfony and WordPress and has now more than 1k stars. It’s amazing! Thanks to everybody having worked on the code base, contributed to the documentation or evangelized about the solution, you rock! Training, development, professional services and workshops are also provided worldwide by Les-Tilleuls.coop, API Platform’s creators. If you haven’t already done it, it’s time to give a try to API Platform! Hi there! First of all congrats for this amazing work you are doing! I have tried to install api-platform using composer but it seems that is still on version 1 using that method. Are you gonna change it soon?